I first sampled this hazelnut cake several years ago at Perbacco Restaurant's Passover Dinner. Joyce Goldstein worked with Chef Staffan Terje of Perbacco to create a menu based on recipes from her Cucina Ebraica cookbook. I remember enjoying the entire meal (Joyce Goldstein is such a fabulous chef), but I especially loved this cake... so much that I've since made it myself many times. 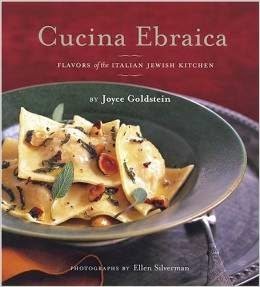 This is one of my favorite cookbooks by Joyce Goldstein, the recipes are simple and delicious! This recipe is quite easy to make, but you will need a couple of special ingredients. The first is matzoh cake meal, flour made from matzoh crackers. Potato starch is also essential to the recipe, giving the cake its delicate consistency. It can be difficult to find. In San Francisco, potato starch should be stocked at Whole Foods, Bi-Rite Market, Rainbow Grocery or other specialty food grocery. Of course, the most important ingredient is the hazelnuts. Start with fresh raw hazelnuts and roast them yourself. I like to roast them slowly at 325 degrees Fahrenheit for about 20 minutes, but it really depends on your oven. Stop roasting when the nuts are golden brown beneath the skins. Allow to cool for a few minutes, then remove the skins (they should come off easily just by rubbing the nuts in the palm of your hands). Use a food processor (or coffee grinder) to finely grind the nuts. Mise en place for baking! 1.) Combine the egg yolks and 1/2 cup of sugar. Beat until the mixture changes color and becomes thick and frothy. 2.) Beat the egg whites until the mixture becomes foamy, then add the 1/2 cup of sugar and beat until the stiff peaks form. Egg yolks should be thick and frothy; egg whites should form thick peaks when you lift up the mixing beater. 3.) Fold the egg white mixture into the egg yolk mixture. 4.) Gently stir in the dry ingredients (ground hazelnuts, potato starch and salt) and vanilla extract. Baking Tip: Do not stir too vigorously, otherwise the cake will not be light and airy. Baking Tip: Make sure that your hazelnuts have been roasted until golden brown and then ground the nuts finely. To give the cake more texture, grind the nuts more coarsely. Here's how my batter looked with coarsely ground nuts, which gives the cake an interesting texture. 6.) Invert the cake in the pan on a wire rack. Allow to cool completely and then very carefully lift off the pan. 7.) Transfer to a serving platter and enjoy! Serve with fresh strawberries and a dollop of crème fraîche. The cake is also delicious topped with ice cream and caramel sauce. For the perfectly balanced flavor combination, try it with Orange-Cardamom Ice Cream from Bi-Rite Creamery and "Lick My Spoon" Caramel Sauce, an artisanal product that won the 2014 "Good Food Award" in the confections category. Wow! A passover desert that will win everyone's hearts! Looks delicious and I haven't seen many recipes with hazelnuts (which I love). I look forward to trying this - thanks! HI Heidi, this cake really is delicious. If you like hazelnuts, then you should love it. This is a nice dessert because it's not too sweet, it's very European style!